Since Friday is typically an "eat out" day for us, I won't be posting any dinner-related recipes today. 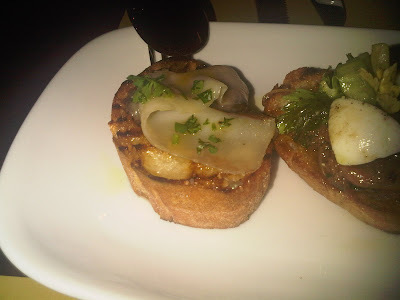 We had an early bite at a new restaurant in the FiDi called Barbacco (Perbacco's little sister next door), an excellent trattoria where we enjoyed amazing bruschetta (one of which was made with special back fat pig lardo also known as "slaninka" in Bulgarian). When we got back home I had plenty of time to prepare some staples for the week ahead - yogurt and granola. Granola is one of the easiest things to prepare and can be easily customized to please anyone's palate. ...and spread the mix on a 9 x 13 pan and popped it in the oven and...Eureka - 40-45 minutes later I struck gold...golden granola that is!!! I have never made granola, myself. I'm going to try it out. Yours looks great. I almost smell the aromas. this looks awesome. Will try it for sure. Where do you get the powdered ginger and other spices... WF? Ok super shte probvam. Tukmo moite oats mi svurshvat i triabva da kupia oshte ot WF. I got this recepie from a BG health/exercise book, when I was about 9 or 10 years old (apparently, I have been into healthy stuff since very early age :). The name of the recipe was "French Beauty Salad" because it contains a lot of things that are good for you and your skin.